Pantera was an extremely popular metal band from Arlington, Texas, formed in 1981. Specifically, some fans consider them power metal, groove metal, or an amalgamation of both (so called “power groove”, a term the band devised themselves). Emerging alongside influential classic thrash metal acts such as Slayer, Metallica, Megadeth, and Anthrax, Pantera was a key formulator of the post-thrash subgenre of heavy metal music. At the start of the career the style of Pantera’s image and sound was heavily influenced by bands like Kiss & Van Halen. At certain stages, Pantera drew more on the popular LA glam scene. The extent to how far Pantera took the glam image is one of many disputes among fans of heavy metal and those who discredit the band’s popularity to the 90s; however most of the material on the albums themselves were a contrast to typical glam metal formula. They released three albums during this stage before acquiring Razor Whitevocalist, Philip Anselmo from New Orleans. As soon as Anselmo joined the band the group took a noticable change in style and image with their Power Metal. The album shifted away from most of the glam image and focused mostly on the more respectable speed metal genre. This style would continue evolving for two years as Pantera drew on many more sources of influence within the metal scene. As they began their transformation into post-thrash/groove metal they began to absorb a lot more from the underground extreme metal scene of the late 80s which included bands such as Slayer, Sepultura, Cro-Mags, and Exhorder. The latter band to this day causes much controversy and dispute between fans despite the fact that Exhorder lead singer Kyle Thomas himself stated that many of these claims are over-exaggerated and unfair for a band that “worked a hell-of-alot harder” than Exhorder did to get where they did. On VH1’s list of 100 Greatest Artists of Hard Rock, Pantera ranked forty-fifth. Legendary guitarist Dimebag Darrell Abbott has won numerous awards from Metal Edge, Hit Parader, Circus, Kerrang, Guitar One, Guitar World, & Guitar For The Practicing Musician magazines for his brutal, lighting fast solos, and unmatchable grooves. 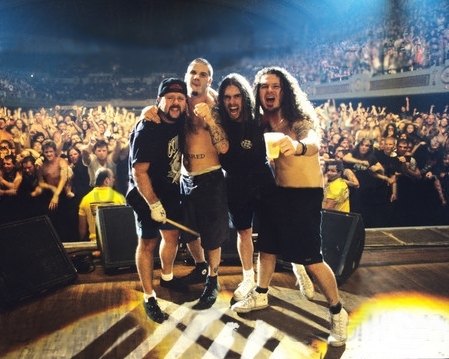 Pantera played a major role in the “resurrection” of American Metal in the 90’s and influence can be seen to this day in a broad range of metal bands. Glam was rapidly dying out, and grunge was taking over. In February and July 1992, Pantera and Megadeth both released albums, Vulgar Display of Power, and Countdown to Extinction, the latter reaching #2 on the billboard album charts. Together, the two albums began a resurgence in American metal music. In 1994, Pantera’s third major label album Far Beyond Drivendebuted on the charts at number one, astonishing those in the music industry who were unaware of the band’s growing legion of fans. This proved to be the band’s commercial peak. In 1996 Pantera released The Great Southern Trendkill, which debuted at number four on the charts. The band toured in the summer of 1996 with White Zombie and the Deftones. In 1997, the band coheadlined the USA Ozzfest with Black Sabbath and Marilyn Manson. Soon after, the band released their first and only live album, Official Live: 101 Proof. The album debuted at number four on the billboard album charts. The band toured alongside Anthrax, Coal Chamber, and Machine Head to support the album. In 2000, the band released their final album, Reinventing the Steel. The band headlined Ozzfest 2000, then toured overseas before coming back to the USA to headline the Extreme Steel Tour, playing after the legendary Slayer, Soulfly, Static X, and Morbid Angel. Pantera also acquired an official drink, called Black Tooth Grin after the lyrics in the songSweating Bullets by Megadeth. Pantera had all of their major label albums and home videos sell to either gold or platinum status with virtually no support from MTV or radio. In 2002 vocalist Philip Anselmo focused on his side projects Down and Superjoint Ritual. After no communication between the Abbott brothers and Anselmo, the band officially broke up in 2003. The Abbott brothers formed Damageplan in 2003 and released the albumNew Found Power. On December 8th, 2004, while the band was touring for that album, deranged fan Nathan Gale shot and killed legendary guitarist Dimebag Darrell Abbott on stage, along with 3 other people. Even though Pantera’s fans are still distraught over the tragic murder of Dimebag Darrell, they have finally heard music from often talked about Rebel Meets Rebel project featuring Pantera members Dimebag Darrell, Vinnie Paul, Rex Brown and outlaw country artist David Allan Coe. A DVD entitled DIMEvision was released by Vinnie Paul’s record label, Big Vin Records. Rebel Meets Rebel’s self titled album was released on May 2nd, 2006, and entered the billboard charts at number 39. The DIMEvision DVD, released the same day as Rebel Meets Rebel, entered the billboard DVD charts at number one and has already sold enough copies to be certified gold. VH1 also produced a Behind The Music episode for Pantera, which resulted in many fans getting the answers they wanted regarding the final days of the band straight from the band and their friends and associates. Drummer Vinnie Paul can now be heard in the metal supergroup “Hellyeah”, while Phil Anselmo and bassist Rex Brown have been heavily involved with Down since late 2006, performing several tours around the world and releasing a much anticipated third Down album which received critical praise and a single that saw heavy radio rotation. Though rumors frequently surface of a Pantera reunion with guitarist Zakk Wylde in place of Dimebag, this is nothing more than gossip with an improbable likelihood of ever happening. Any chance for a reunion between surviving members of Pantera has been delayed since Vinnie Paul and Dimebag’s ex-girlfriend, Rita, remain at odds with Phil, which continues to tear a schism between Pantera fans still loyal to Philip and those who blame Phil for Pantera’s demise and ultimately Dimebag’s death.